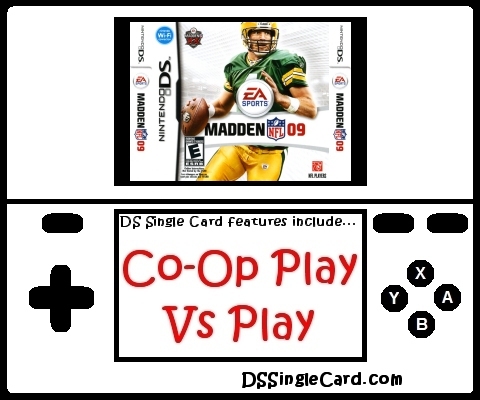 Alternate Names: "Madden 09", "Madden DS 09", "Madden NFL 2009", "Madden 2009", "John Madden Football 2009"
Take your game on the road using wireless mode to play Nintendo DS-exclusive mini-camp games with up to 8 players. Test your skills in three new Rec Room mini-games: Last-Minute Miracle, Hit the Hole, and Playbook Flash. Using just one copy of Madden NFL 09, challenge anyone with a Nintendo DS in single-card mode.